Many properties of materials depend on how the atoms making up the material are arranged in a specific periodic structure. This fact, together with the electric forces that glue atoms together, can explain, for instance, why some materials are metallic and other insulating. Such a static arrangement of atoms is the simplest approximation used in the basic course of the physics of matter. The next approximation step, a crucial one to explain many other collective properties (such as how heat is hold and transported), is that atoms are not still, but that they vibrate around their equilibrium position, forming wave-like patterns. In quantum mechanics, every wave has a quantized energy packet (a minimum unit of energy) associated with it, something we usually refer to as a particle. The same is true for these waves of atoms, and such particles are called “phonons”, from the greek word for sound, phōnḗ (φωνή). It is indeed the vibration of atoms that allows sound to propagate, both in air and in a material. In the class of socalled “quantum materials”, these quanta of vibrations are heavily under investigation, because they are possibly the key to explain exotic properties such as superconductivity (the loss of electric resistance) and ferroelectricity (the appearance of a spontaneous electric polarization) in these materials. 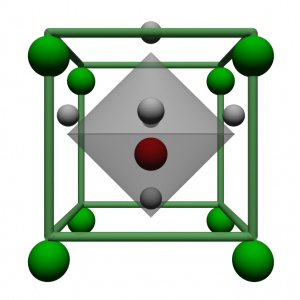 SrTiO3, strontium titanate, is an archetypal quantum material with perovskite structure where many of these exotic properties have been observed, and are believed to be closely connected to the presence of peculiar phonons. For instance, Alexander Balatsky at Nordita at Stockholm University has recently predicted that such phonons are associated with the onset of superconductivity . With this theory, Balatsky and co-workers predicted that straining this material, i.e. affecting the structure and hence the vibrations of the crystal, could lead to a substantial increase of the critical temperature for superconductivity. Indeed, this has now been observed experimentally . The key message is that by controlling phonons, one can control the properties of matter. In a work just published in Nature Physics , we now show that with intense, short electric field bursts in the terahertz frequency, we can “shake” atoms to such an extent that sizable electric polarization is created in the material for a short time, and that unexpected or normally “silent” vibrations (i.e. which cannot be excited with light) start to occur at a frequency higher than the one we used to start the motion. In this technically challenging experiments, we used the femtosecond x-ray bursts generated at the LCLS free electron laser at Stanford, to directly look at this atomic dance. This allowed to understand that the appearance of the higher frequency phonons is due to a strong anharmonic coupling between the different vibrations. Our results reveal a unique and yet not fully understood view of the physics of phonons. It also indicates a new path towards accurately controlling and understanding atomic vibrations, and in turn the exotic properties of quantum materials, a key step towards a technology beyond silicon.